Evangelist Rev. 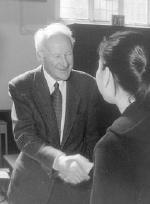 John Stott speaks to faculty and students at Wycliffe College on a recent visit. A PROMINENT Anglican evangelical conservative based in Britain, Rev. John Stott, recently spoke in Canada on Christianity and tradition and commented upon the irregular consecrations of two American bishops. Dr. Stott was the Queen’s chaplain for 32 years and has written 37 books. For 55 years he was rector (now rector emeritus) of just one parish, All Souls, London. Preachers have to listen to the world’s “many discordant voices: the cries of the poor and oppressed, the questions of the bewildered, the sighs of the hurting. We listen to the body broken. We are called to double listen. “We listen to the word of God to believe and obey it and we listen to the modern world to sensitively understand it. Rev. Barry Parker of St. Paul’s Church, Bloor Street, in Toronto, said he considers Dr. Stott’s Between Two Worlds (1982) to be one of the most brilliant books on preaching. With his book royalties, Dr. Stott has established the Langham Trust, which has provided books and 100 doctoral scholarships at Western seminaries to promising, young, evangelical scholars from the developing world. A bachelor, Dr. Stott is affectionately known as “Uncle John” to hundreds of Asian and African young people. Remarkably he corresponds with 1,400 people worldwide. In an interview after his lecture, he said he “rather regrets” the recent consecrations in Singapore of Americans John Rodgers and Charles Murphy. For Dr. Stott their consecrations do not signal the end of the Anglican Communion. Sue Careless is a Toronto freelance journalist.